Hi. I'm looking for a small version of something like the philjonesbass topper - a box with small speakers that can sit on top of my smaller rig and aim some of what I'm playing to my head, without annoying the rest of the band or mucking up the audience mix. I'm imagining it'd be an angled thing with a few 5" speakers, or something like that. I'd love to hear your suggestions and experiences. Thanks! Me too I would find that useful. I have read that mixing brands of speakers is not a good idea due to potential phase differences but still I'd like to read what recommendations you get. Thought about in-ear, but they don't work for me. I know there's way more control, etc but i need my ears for the band and vocal mix and I just don't play as well when i feel sonically isolated. Good to know that someone's thought about bass players with in-ear, though. Thanks! This also has a lot to do with the size of the venue and the volume of the band, right? In-ears can be very helpful if you're in a giant or particularly echoey room - and if you have a good monitor operator or a self-mixing setup. Also in those cases the less bass rumbling around onstage the cleaner it will sound in the PA (the BIG amp). But in-ears are not for everybody and don't make sense in a small venue or lower volume situation. One idea; instead of searching for another bass cabinet and getting caught up in what amp, EQ, comp, etc, just for that, maybe you could dial a bit of bass into your monitor wedge? That might give you the presence you're missing by not hearing your amp cabinets straight on. Don't have monitors? Look into getting a small self-powered wedge to run off your rig just to hear yourself better. But watch that overall stage volume, don't hurt yourself! AccuGroove makes floor monitor wedge cabinets that face backwards away from the band & audience. I have the "Wedgie" that is a 3 way cabinet with a 12/6/dual tweeter setup & it sounds amazing! I can actually play softer & still hear what I'm playing because the cabinet reproduces the entire spectrum of sound Alembics are capable of. It is plenty loud & handles my low B easily. They just came out with a smaller version that has a 8/6/dual tweeter setup. I'm sure it sounds amazing too. So if you're looking for something to supplement your existing rig that is directional & will focus the sound to your ears, the new Mini Wedge might be the ticket. If you want a stand alone box that will handle anything you put through it, I highly recommend the Wedgie! jimmyj - can't rely on having monitors, which is why I was thinking of something i could aim at my head... The accugroove MiniWedge looks like it could work for me. Can't seem to find a price for the MiniWedge anywhere, though. I'll shoot them an email. Thanks for the pointer on that, rusty! You're welcome Mark! Email Mark Wright at AccuGroove & he will give you the price on the Mini Wedge. He just unveiled it at NAMM today, so it is brand new! Accugroove cabinets aren't cheap, but they are the most amazing sounding cabinets I have ever heard! 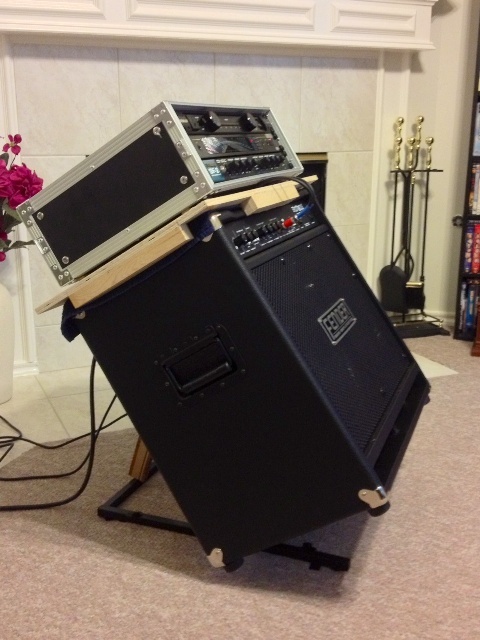 I replaced my Eden stack that had a 410 & 115 cabinet with my Wedgie & the Wedgie not only sounds much better, but takes up much less room on stage & only weighs 29 pounds! Mark from AccuGroove got right back to me. Their stuff looks great and I've only heard great things about the sound, but you're right - not cheap. Out of my price range for now. Apparently the Fearless cabs are pretty great at this as well. The do the wedge thing as well as the standard bass cab thing. Ed Friedland is all about them. I still have a couple SWR Bass Monitor 12s from back in the day. They don't produce low lows, but they do have a very pleasing sound to my ears. The last two times my band played out and had soundboard recordings made, the bass was way too low in the mix. I'm thinking that's because the stage volume of the bass amp was too loud for the sound man to put much bass guitar in the house mix. 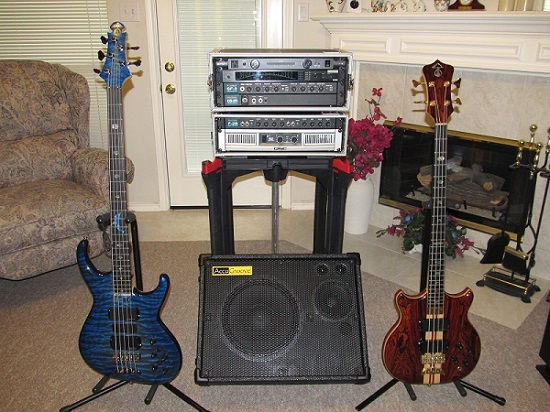 We may be moving toward a smaller bass amp set-up, and putting more bass in the P.A. system, and the SWRs may be coming back into service in this application. I use an SWR Workingman 12 combo with (usually) a Stingray for most small club gigs, and the two are made for each other. 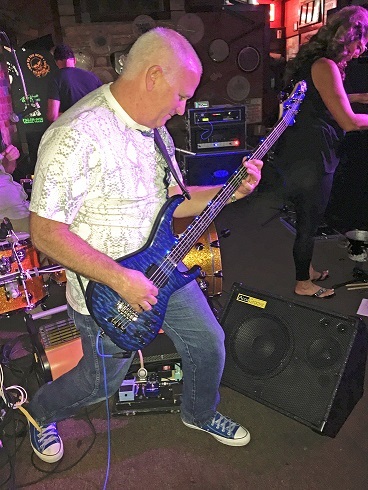 The SWR has an extension line out for another cab, and I have a 2x10 SWR Goliath cab to add to it that will be loud for most outdoor gigs we do in the cover band I am in. The SWR stuff has a built in direct out for a line to a soundboard. I like the 10, 12, and 15 SWR line of Workingman's combos, but NOT any of the other SWR small stuff at all. I also use a SWR 550X with big cabs for really large venues. I am looking for a Workingman's 10" combo, for even less weight! I used one a lot with a band I was in that had it in a practice space. Maybe this? Kustom Monitor $70. If you don't like it, return it. What are you using for your rig? When I need something small I use one of my 2X10's and set it on a small table to get it up closer to ear level. An angled amp stand would work too but you would have to set the amp/rack off to the side. I use the Accugroove Wedgie, small, light, and has a clear flat response. I got rid of my other cabs after hearing the Accugroove. But Keith has a good point, if you already have a cab that you like, try to come up with a way to direct the sound at your head. I once made a light weight angled cab stand out of PVC pipe and a foam wedge, it worked well. I have played through a Fearless & it had tons of bottom end, but it did not have the range or flat response the AccuGrooves do. Before I got my Wedgie I used a Fender Rumble combo on a tilt back stand, so you might try that if you are happy with your existing cabinet. I made a platform to sit on top of the Rumble that had wood strips on top so I could sit my rack on it tilted back without it sliding off. The AccuGrooves are expensive, but very much worth the price if you can afford them! I will never buy another brand. 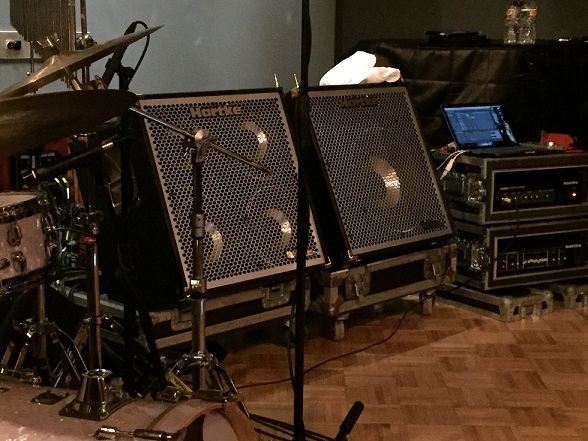 Victor Wooten has a simple solution to angling the cabs. You could easily build a wooden flat cart and screw a two-by-four on the front edge to create the same effect. That's definitely simple My next gig I'm going to try angling a spare 2 by 10 cabinet I have and just see. I'm continuing to look for somethign even smaller so it won't affect anyone else on stage, and my cabs will still aim at the audience. Might end up building something, but probably not too soon. Glad you got what you wanted! Enjoy!